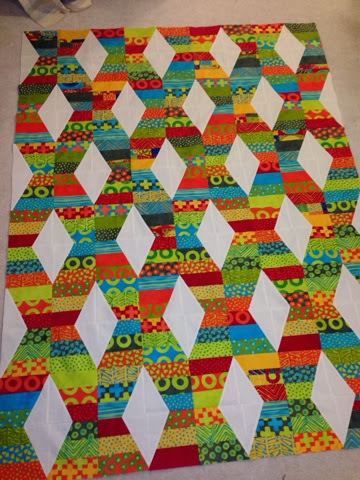 This is a Jaybird Quilts Pattern using the Lazy Angle Ruler, and I am so glad to have made use of the ruler, the pattern AND the jelly roll. I bought this fabric in a jelly roll long ago, because I loved the fabrics but didn't know what I was going to do with it. Jelly Rolls, priced at $40, are a big commitment to small strips, and I've been hesitant to go whole hog into that process, but in this instance, worked out fine. I've got three more to get crackin' on! I am only now noticing that my favorite Malka Dubrowsky fabric isn't in this stack. Go figure. I love how this is turning out; the cutting and piecing is working out pretty quickly, and the result is visually striking.